Would you like to search for images by visual similarity? I thought so. This is a hot research topic, and there are even a few content-based image applications that you can already play with. CogniSign’s xcavator application seems quite advanced. You can choose a starting image, then click to define “important bits” that must be present in the matching images. As you click, the set of matching images is constantly refined to match your clicks. The demo seems to work well, but their database contains only a sample of images from Flickr. Be sure to watch their video intro before you try the demo. LTU Technologies’ Image-Seeker examines both appearance and keywords to help you browse to similar images. This is perhaps less ambitious than the approach taken by xcavator, and I felt that keyword similarity was weighted too heavily compared to visual similarity. There’s a demo which enables you to browse the Corbis royalty-free images by choosing a starting image from a random set and progressively clicking on images that are closer and closer to your target image. VIMA Technologies’ Visual Image Search lets you search a sample of 40000 Flickr images. Each image has attached to it a plus button and a minus button, which enable you to refine your query by clicking on images that either match well or that match poorly. In contrast to the above applications, which are essentially technology showcases, imgSeek is an open-source application that you can download and run on your own system. It’s a photo collection manager which provides for the usual kinds of browsing and adds a similarity search. 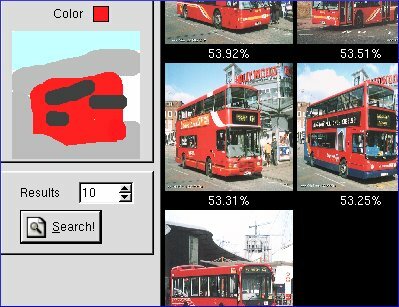 You can either provide an existing image as the seed for the similarity search, or you can use the mouse to sketch a few lines and blobs in relevant colours. It seems to do a pretty good job of finding matching images (check out the screenshots). But imgSeek won’t scale to searching all the images on the internet, which is what many of us would like to do. That’s something which is “not quite there yet”, and you can be sure that the likes of Google are working furiously on it. This entry was posted on Wednesday, November 22nd, 2006 at 9:03 pm	by eiffel	and is filed under Search Engines. You can follow any responses to this entry through the RSS 2.0 feed. Both comments and pings are currently closed. A server-side version of imgSeek is now available: Server side imgSeek is a standalone server program capable of adding content-based image querying to any image related website.